This place was exactly what I was looking for. Its in a great location. Walking distance to downtown. The kitchen was well appointed with a gas stove and all the cutlery, dishes and pans you would need. Made it easy to make my breakfasts in the morning. The bed was very comfortable and I really appreciated the air conditioner and fans to keep the place cool in the middle of the summer. I will be back. A perfect sunny Easter Sunday in Bend. We LOVE the Penny Luck Cottage! From the location to the fully stocked kitchen to the pleasant back yard, it was just the right spot for our family of 4. The boys enjoyed their loft space and walking down the block to rent a movie at the red box. The owners seemed to think of everything-- there is even a milk frother! Cant wait to come back! We came all the way from Missoula to enjoy a few days in Bend! We had a blast, this place was awesome, so close to everything, and Mount Bachelor, too. We rode our bikes to all the breweries... FUN! Thanks for everything! We arrived just after an unusual snow storm in January, but were able to steal three days of skiing at Bachelor. We loved the cottage! A great place to come home to everyday and perfect for our family of three. Walking to the grocery and great restaurants in the neighborhood was a treat. We especially loved the comfy bed. The cottage had EVERYTHING we needed. Perfectly comfortable. We are looking forward to coming back in the summer! Thanks so much for making our stay so enjoyable. The house and location are perfect-- so cozy and so close to everything! We hope to see you again soon! The Penny Luck Cottage was super clean and very well appointed. All we needed to do is show up with our clothes and toys (Mountain Bikes) and we were totally set! 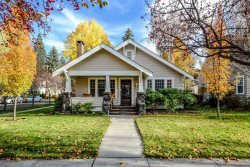 It is located in one of the best neighborhoods in Bend. Super easy to just park the car and walk or cycle to the market, bakery or whatever......Our teenage son loved the upstairs room. Also, the back yard has a BBQ area that is perfect for relaxing. There is no need to stay in a hotel with a property like the Penny Luck Cottage available. It provides so much more value for the dollar. We look forward to our next stay!